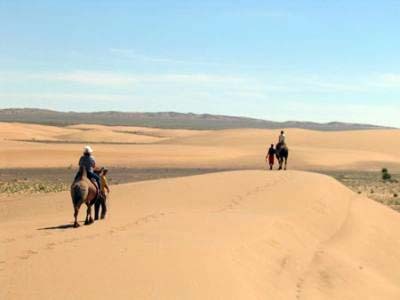 Khongor dunes, ”Khongoriin Els”, are the most important sand mass of Gobi Gurvan Saïkhan National Park. Its area is more than 900 square kilometres (347,49 square miles). It’s one of the largest sandy areas of Mongolia. Suddenly standing out from the plains, they are undoubtedly among the most spectacular of the country. The wind continuously blows from North towards West and the dunes can reach breathtaking heights, between 100 and 300 metres (328,08 – 984,25 feet) at their highest points. 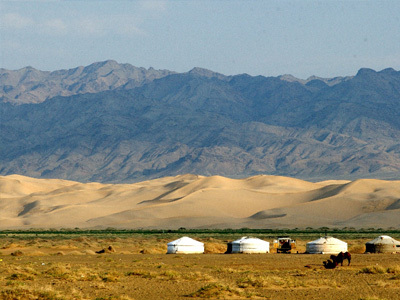 Khongor dunes are more than 180 km long and can reach 27 kilometres (16,28 miles) wide. The inhabitants name their imposing dunes ”singing dunes” due to the noise made by the wind when it moves the sand. Beyond the dunes, the steppe extends as far as the eye can see.